Every now and then, we see a gin which does something so crazy, it absolutely blows our mind. Before we even get it into our glass. Hernö Juniper Cask Gin is one of those. 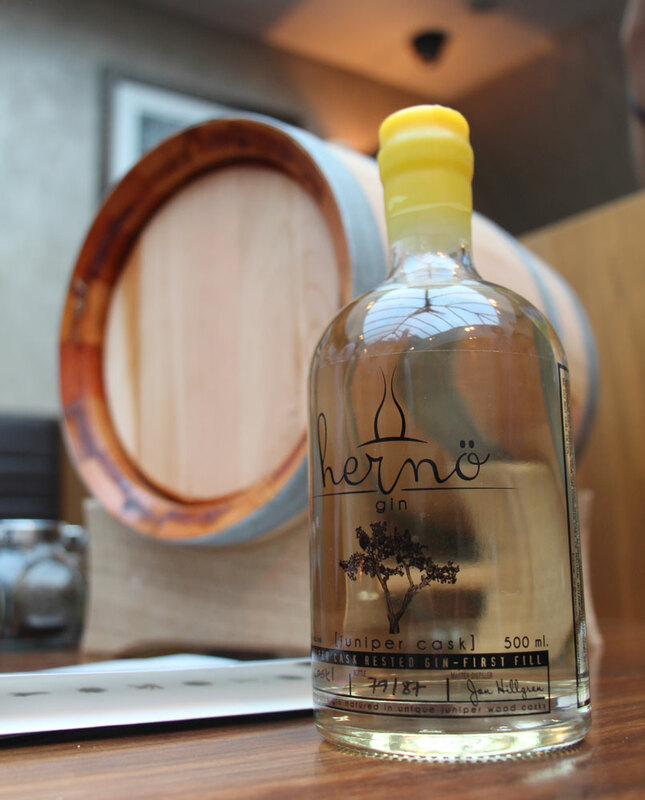 When I hear about Herno distillery’s intention to age gin in a cask made out of juniper wood, I was absolutely boggled. Firstly, and pardon this preconception held by those of us who mostly encounter these small little garden variety junipers, with scraggly winding branches that peel and flake. All in all, I didn’t think you could do anything with the bark whatsoever. Sweet orange and lemon on the nose, bright and vivid. Candied almost. Hint of resin and spruce on the finish, a tad woodsy. Maybe a slight Christmas tree hint. Very pleasant. The palate has many notes recognizable immediately as Herno gin. The taste is a bit sharp, early on a bit citrusy, hints of berry, and buttery cinnamon. The mid palate is where the aging notes of Hernö Juniper Cask Gin begin to take shape, taking on an almost unexpected form: fresh sawdust, the smell of fresh lumber at the hardware store, a bit woody, turning resiny and piney with a bit of burnt wood and char. A very interesting character, vastly different from most aged gins. The finish is long, more notes of resin, pine sap, and tart fruit. Wow, quite a flavor, and quite intoxicating. There’s a lot of different sides to this flavor, which come out at different points within the taste. I don’t normally go for Aged Gins in a Gin and Tonic, and although I tried it, I can’t say I would come back. Some of the wooden notes come through, as well as the acidic tang on the finish. But overall, it just didn’t do the drink justice. I liked how it worked in a Negroni, though think for maximum appreciation you might want to go 2 parts gin to 1 each of Campari and Vermouth. But when you do this, you really fully appreciate the rich character of the gin. I think this was a really successful drink. Trying to think outside of the box, I went with a Martinez. It was really interesting, as the woody notes were highlighted, a kind of herbal, sweet, but still with this distinct note of fresh cut wood coming through. I wasn’t as excited about it in drinks as I was neat. Aged gins are really coming into their own. As distillers continue to be more and more creative, aged gin is becoming a category whose range and diversity will only continue to impress and surprise. Hernö Juniper Cask Gin is a superb and ultimately, well balanced gin that pushes the boundaries and expectations for what an aged gin can and should do.